There are two ways that your administrator may have set things up for entering task progress. The steps you take to report your task progress are different, based on which way your organization is set up. How do I know which way my organization is set up? You could ask your administrator about whether your organization is using single entry mode, but an easier way to figure it out on your own is to look at the Quick Launch. If your organization is tracking time and task progress separately, you’ll most likely see both the Tasks and Timesheet views listed on the Quick Launch. This means that your organization is most likely tracking time and task progress separately. Enter your time as hours in the Timesheet view. Report the percent of work you’ve completed in the Tasks view. Update how much work you have left to do in the Tasks view. This means that your organization is most likely tracking time and task progress in the same view. Report the percent of work you’ve completed in the Timesheet view. 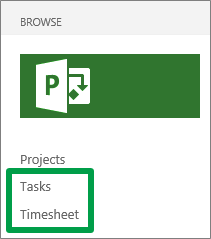 Update how much work you have left to do in the Timesheet view. If you’re still not sure, ask your coworkers! They’ve probably already been submitting time and task progress, so they should know where you should be entering your hours.